Knob Puzzle Numbers is a great fun way start to learning those tricky numbers. With lovely bright colours and good size knobs for little fingers this is a lovely way to begin matching shapes, colours and numbers. When you remove the shape it's corresponding number is underneath so it's a challenge to match them up. 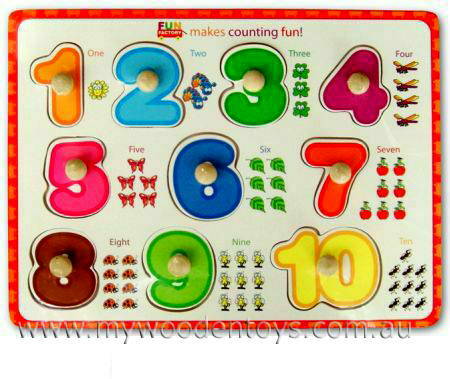 Next to each number there is also the written number and sweet little pictures of butterflies, bugs and ants to name a few, so there are lots of ways to learn and match. Material: Wood with wipe-clean heavy duty gloss printed paper. We like this because: "lovely way to start learning numbers through play."